Shih tzus need regular brushing. 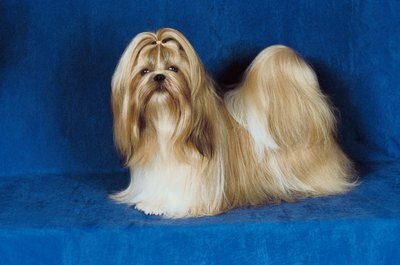 Shih tzus need lots of brushing and combing to maintain their sleek appearance. You may need to brush your pet every day to keep his coat smooth and shiny. Try brushing in the evening when your dog is tired from a long day and less prone to the wiggles. Mist your pet's coat lightly using a spray bottle filled with water and one capful of cream conditioner. Shih tzu hairs will break if combed when fully dry, thanks to static electricity. Brush your pet's hair from the roots closest to the skin to the ends. Shih Tzu Fanciers of Southern California suggests beginning at the back of your pet with his feet, legs and belly. Use a slicker brush made of soft plastic to work through the coat. If you encounter a tangle, use a plastic pick to gently pry it apart. After brushing out the hair with the slicker brush, run through with the comb. Mist any mats with cream conditioner and allow the conditioner to soak in for three minutes. You may find mats around the legs, neck and ears. Mats look like clumps of tangled hair. Untangle the matted hair using your fingers, then brush through the area with the slicker brush. Brush the remainder of your shih tzu's coat in the same manner, working from roots to end. Don't forget to comb your pet's facial hair too. Moisten a washcloth with warm water and clean any gunk from your dog's eyes. Part your pet's coat from the crown of the head to the tail using your metal comb. This is just like parting your own hair. After brushing, put your shih tzu's hair in the traditional topknot to keep excess hair out of his eyes. Simply pull back the hair and secure it with a bow or elastic band. Talk to your dog while you comb to soothe him. Shih Tzus; Sharon Vanderlip D.V.M. Can You Over Brush Your Dog?